I make this fudge EVERY year at Christmas. Yesterday was no different. It just so happened that it ended up being the “light at the end of the tunnel” for my little guy yesterday afternoon. I have been trying to get my kids in for flu shots for weeks. It’s hard to get 4 kids and myself to the doctor all at once without missing school. Then every time I had it scheduled, someone came home from school or stayed home sick. Yesterday I said that’s it! Today is the day! I texted my two high schoolers and told them to meet me at the doctor’s office after school. I picked up my two 9 year olds and headed over. My youngest son asked why we were turning and I said that we were getting our flu shots. So, I did what Mom’s do best in awkward situations, I changed the subject. Asked them about their day, and told them about what I had baked. Thank goodness. It was what pulled him through! 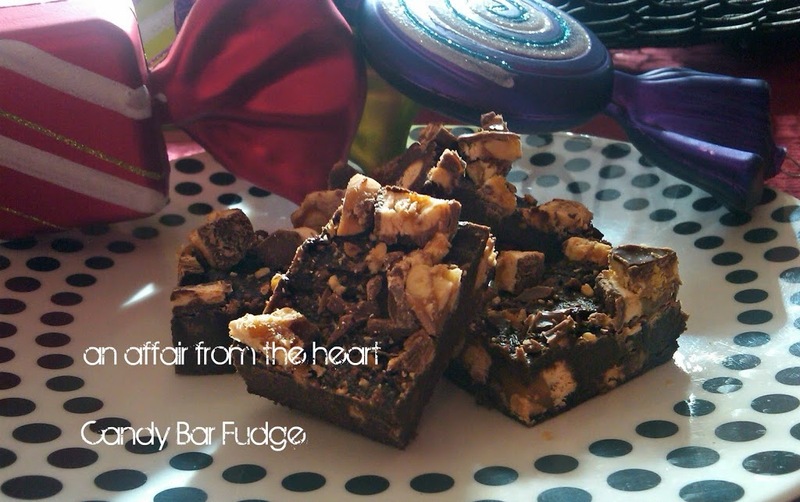 This fudge is so darn easy!! It literally has 3 ingredients. Line an 8×8 pan with foil. Spray with non-stick spray. 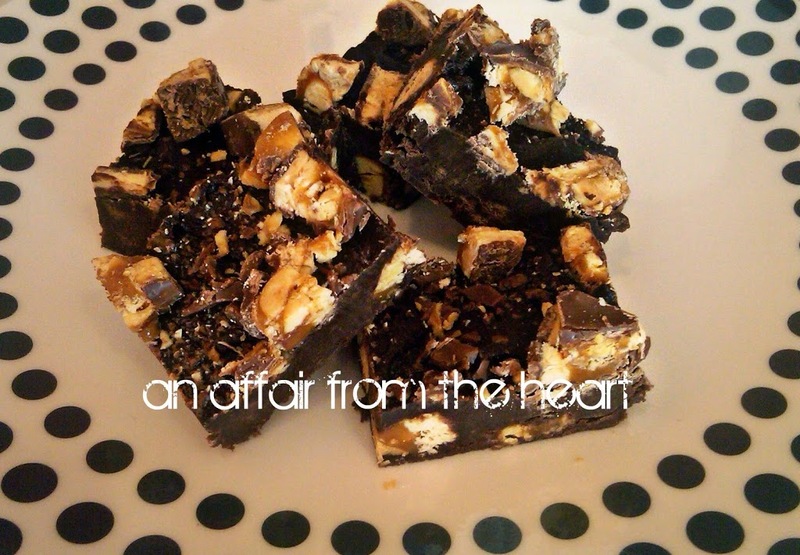 Chop candy bars, reserving about 1/4 cup. Melt chips over low heat in saucepan. hen melted add the frosting and stir until smooth. Add chopped candy bars, stir. Top with reserved candy bars, and chill for at least one hour. Cut into squares with warm knife. I have also made this with Butterfingers. The Snickers is the hit at my house. You could use about any candy bar I would think? I bet if you were an Almond Joy fan that would be awesome! This was just what I needed today, hugs to you! I wish I had half of your energy. I also wish I could follow you around in the kitchen like Gabby and Sully and beg for samples! Welcome, Bridgett!! This fudge is super yummy!! Snickers are my favorite! OMGosh, I can’t wait to try this. Thanks for sharing at Church Supper. Have a blessed week and Merry Christmas!! Love the story behind this, yes this would make shots much better, lol. Thanks for sharing on Holiday treats week, hope you will link back so others can join in too. This looks delish! I’m trying to pin to Pinterest & for some reason it I keep getting a message saying there are no pinable images. Have you had this happen before? Just wondering. I’m going to be trying this recipe soon! I have been having MAJOR pinterest issues!! I can’t pin from my OWN BLOG!! 🙁 I am trying to get it resolved. When wedding planning gets overwhelming, you’ll welcome the one part you won’t mind planning over and over again, the wedding candy buffets!